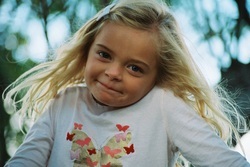 My husband Colin and I were so excited on October 11, 2005 when our 4th child Kellsey was born beautiful and healthy. Her two older sisters Savanah and Kennedy and her older brother Garrett were thrilled to find out they had a new baby sister. The first year of her life was filled with the usual first words and first steps and everything seemed normal until June 28, 2007. 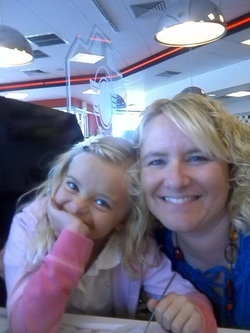 We took the family out to lunch and noticed Kellsey smacking her lips and acting very sleepy. I then decided to take her home and lay her down for her afternoon nap. Twenty minutes later my oldest daughter Savanah (then 10yrs.) looked up at me and out of nowhere asked me to check on Kellsey. I then went into her nursery to find her laying on her back unresponsive and blue. At first I was sure she must have choked on something, so I began sticking my fingers down her throat. It was soon clear that was not working and I told all the kids to get in the car and raced her to the hospital. When we arrived they immediately began working on her until she was responsive. Although she was responsive she was still "status epilepticus", which meant she was continously having seizures one after another. The Quad City area hospital administered the typical treatment for seizures, but could not get them under control. An EEG would be needed which was unable to be performed locally. We were told she would have to be transferred to the childrens hospital in Peoria, IL, OSF, Children's Hospital of Illinois. 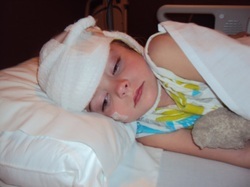 After more labs, spinal taps, an MRI and an EEG we were told that Kellsey had Epilepsy. She had suffered many complex partial seizures which would not stop so her body was shutting down to protect itself. 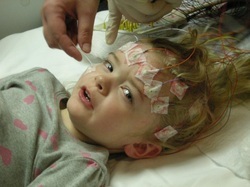 They then proceeded to give her a loading dose of Phenobarbatol until they felt they had her seizures under control. She was kept in the ICU and monitored for a few days. When they felt everything was okay and the seizures had stopped we were discharged. After being discharged from the hospital we began our journey living with Epilepsy. Kellsey is surrounded by Family, surrounding her with love. Older sisters Savanah and Kennedy along with big brother Garrett travel with her while mom and dad pilot the journey not knowing which direction Epilepsy will take them. Kellsey gets an EEG every year. An EEG can detect abnormalities related to electrical activity of the brain. They do not hurt, but are very uncomfortable. Kellsey has to stay up very late the night before and wake up really early the day of the test. Kellsey is 6 years old! Kellsey climbing the tree at her Grandma's house. 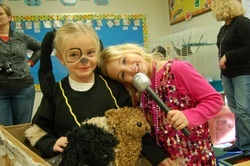 Although she has epilepsy she is able to do many of the same things as her friends. Kellsey's big brother Garrett got her a bear for Christmas 4 years ago. His name is Ticky and he is 4 years old. He has epilepsy too and goes every where she goes. He is quite the traveler! When she is at school he waits for her in the car and when she gets home he continues his journey by her side. Ticky wears his purple ribbon too, hoping to increase awareness of epilepsy so that some day we will find a cure! Kellsey prepares her bear for his blood draw. Kellsey has to have her blood drawn a minimum of every 3 months. However, when she has a seizure or is in the process of changing dosages or medication her blood has to be drawn more frequently. Kellsey was very excited about starting Kindergarten this year. As the youngest of 4 children it was finally her turn!! Sherrard Elementary is educating Kellsey, and Kellsey is educating them about epilepsy! 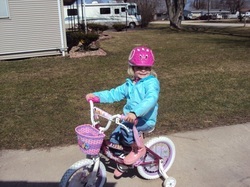 When diagnosed the doctors did not know what limitations Kellsey would have, or even if she would be able to ride a bike. Although her medicine can cause her to sometimes be off balance she is still able to ride her Princess Bike! continuously ask if she had fallen or if we had a family history of epilepsy. weeks! But there is always the hope that by adding another medication you can prevent them altogether. So another medicine was added, Zonegram. However, Zonegram was only available in capsules, not liquid. The capsules would then have to be liquefied by mixing with juice. It has since changed again and she now takes Keppra and Vimpat. Doses will continuously be increased then decreased and medicines added then removed as she grows. This regiment is a lengthy complex process that is constantly monitored with lab work and blood draws. This process will never end for Kellsey or any of the others that suffer with epilepsy, until there is a cure! She continues to have seizures every 4 to 5 weeks and her medical team will continue to make changes in attempts to completely prevent them. those unaware and most of them happen during her sleep. After a seizure Kellsey begins to have shallow breathing for a period of time and then becomes very tired. After nearly losing her during her sleep once I was determined to get some help. Her dad and I could not stay awake all night all the time and still function during the day. We purchased a video baby monitor, but would still spend the entire night watching it. She often slept in our room which made it uncomfortable for everyone. Determined to overcome a life of sleep deprivation we did some research and looked into a seizure alert dog. With the help of Kellsey’s Dr. and the drug co. Keppra we were approved in 2008. In August of 2011 we were notified that our file had been pulled and we would soon be receiving a home visit. This was exciting news as this is the last step in the process of receiving a dog. Receiving a seizure assistance dog does not only help alleviate a life of sleep deprivation, but will also be another avenue to increase awareness. Kellsey takes her meds every morning and every night and never complains. She puts her arm on the chair at the lab and doesn’t cry. She simply looks at me and says “I don’t like the airplane”. The medical term for the airplane would be the “butterfly”. Even with a life of butterflies and airplanes she never gives up! She is constantly telling her siblings to “never, never give up”. Please share this journey with others and help my “walking angel”. We will never give up on our “walking angel” and hope you won’t either! A cure for epilepsy is not known, but is needed. By increasing awareness we are making the small strides needed to battle this disease. Please share our story and increase awareness about epilepsy so that someday we will find a cure! Thank You! - Brandi (Kellsey's Mom).